Melbourne's love affair with classic afternoon teas has reached new heights – literally. 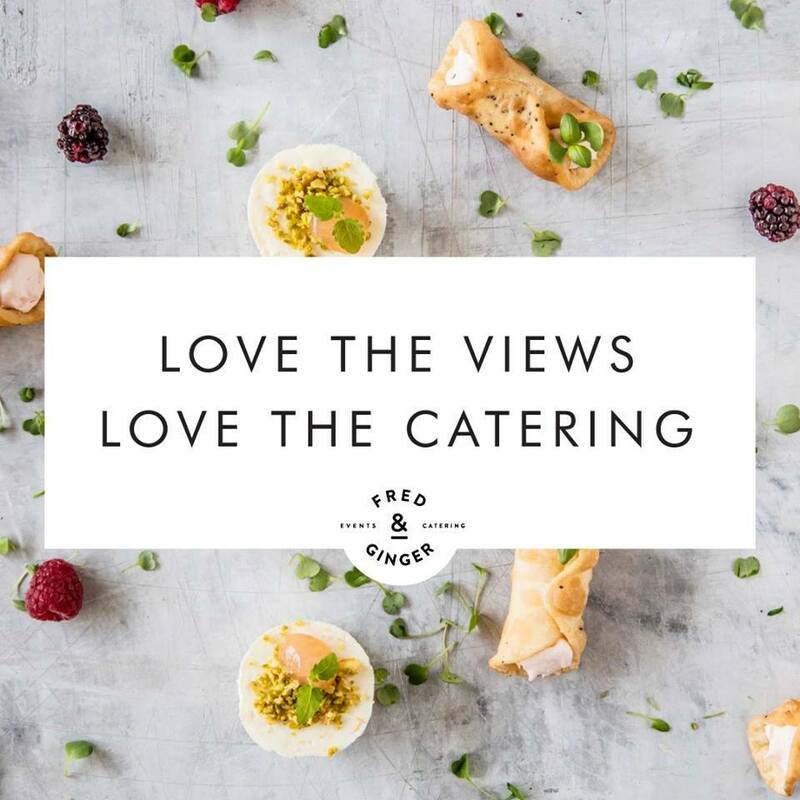 Imagine nibbling on your finger sandwiches while looking out on unsurpassed 360-degree views across the city's skyline all the way across to Port Phillip Bay and as far away as Mount Macedon and the Dandenong Ranges. In fact, you can see 40 km into the distance. The high tea is created by the catering firm Fred & Ginger known for its work at Melbourne Food and Wine Festival's House of Food and Wine, and for its catering at major events such as City2Sea and Portsea Polo. They create handmade food using sustainable and seasonal produce. Your group is not in with the throng, but in a hosted cabin where the high tea is laid out on a table. As it is your own cabin you can enjoy your choice of music. The Sky High Tea consists of mini chicken, avocado and aioli poppyseed bagels, pumpkin, goats cheese and sage savoury damper (v), chicken, sweet corn and paprika savoury bite-size tarts, white chocolate and honeycomb lamington bites, house-made scones with local Yarra Valley berry jam and vanilla cream and a bottle of selected Victorian sparkling, white or red wine. 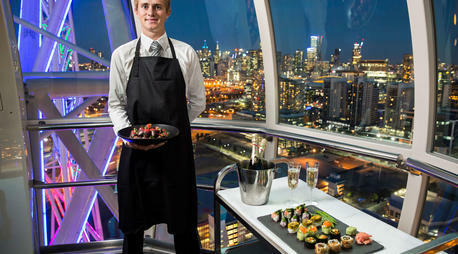 Your main expense is the venue hire but before you gasp you can share the cost with other guests. The cabin holds 14 people, so it is worth organising a party and this would be great for a special birthday or occasion. A single rotation with a private cabin is $545.00. This covers the cost of the first 2 guests for their afternoon tea then (additional guests @ $41.00pp ex GST). A double rotation is $605.00 ex GST per 2 guests (additional guests @ $59.00pp ex GST). While the high tea sounds grand there are also other simpler options such as sparkling wine or mulled wine in winter with a mix of white, dark and milk chocolate covered strawberries. This is @ $38.00pp plus the cost of the cabin or you can also take a cheese and wine/beer flight. This includes four tastes of perfectly aged local Victorian cheeses matched with a selection of Tahbilk wines or Australian Craft Beers. Prices on request. hamper delivered to your cabin, then it is @ $27.00 ex GST each (minimum 10 per order). This includes a classic poached chicken house mayo baguette, kale & quinoa super salad and a flourless marmalade cake with almonds. The lunch hamper is even more substantial. This has a crispy pork belly, apple fennel pickle lettuce baguette, a roasted cauliflower harissa eggplant, pomegranate & labneh salad, spiced apple teacake and seasonal fruit. The cost is $34.00 ex GST each (minimum 10 per order). Or even more filling still is the Star Hamper @ $45.00 ex GST each (minimum 10 per order). This has a mini-multigrain sandwich of poached chicken mayo avocado rocket, a poppy seed bagel regal smoked salmon capers cream cheese & dill, a zucchini mint and goats cheese souffle, truffled mushroom goats curd and lemon thyme tart, little kale & quinoa super salad, rice paper rolls green apple coriander lemongrass and noodles and to top it off a little lemon curd tart. There are also shared hampers with cheese boxes starting @ $22.00 ex GST per guest (min 10 guests). This contains perfectly aged local Victorian cheeses, with Yarra Valley plum conserve, crispy lavosh and black pepper and fig bread. 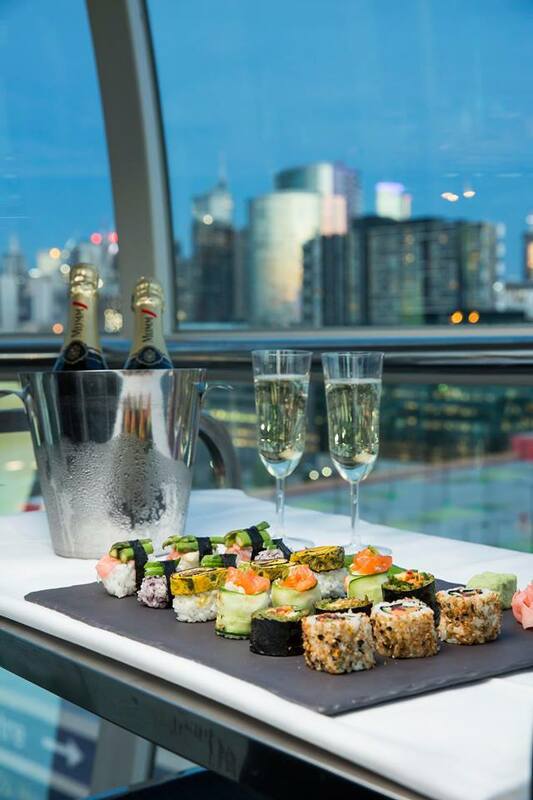 Or Japanese inspired treats @ $22.00 ex GST per guest (min 10 guests), a selection of sushi, salted edamame, okonomiyaki, teriyaki beef skewer, wasabi peas and wakame. There are 15%surcharges on public holidays. For that special occasion give it a whirl. Why? A special occasion perhaps? When: During operation hours. See website. Cost: Various - see article.